PYA Solutions provided services | PYA Solutions. All rights reserved. Diagnostics: what are your challenges and needs and how our software solutions can satisfy those needs the best. Analysis: what are the exact requirements of your business and how our software solutions fit those needs, what customizations are needed, what overall budget will be needed in order to fulfill your requirements. 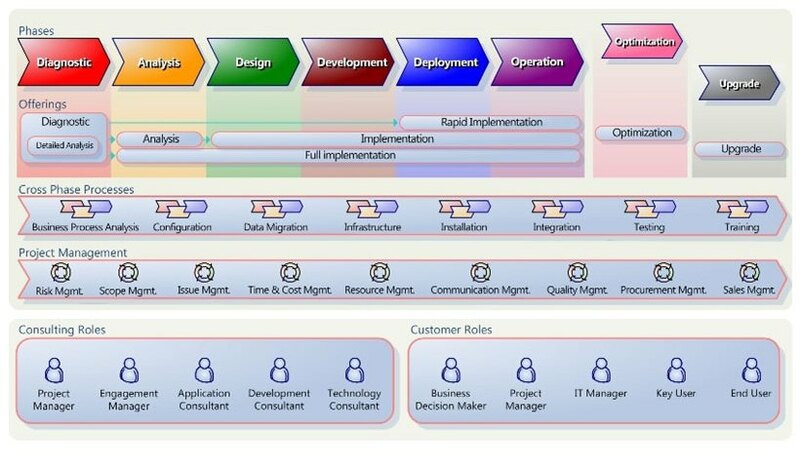 Design: how the outcomes of the analysis will be reflected in the software solution. Implementation and development: the software solution with all the modifications and customizations agreed to being implemented using proven methodology. Deployment: system goes live, is tested again in the natural environment, your company learns to use the new software solution. Operation: the first month using the new system is closed, initial project is completed. Support: additional user-training, development work and other related services are provided if needed. In servicing our customer, PYA Solutions uses the Microsoft Dynamics Sure Step methodology. Sure Step is a full customer lifecycle methodology for all Microsoft Dynamics solutions, providing the Microsoft ecosystem with comprehensive sales through delivery guidance, project management discipline alignment and field-driven best practices. Sure Step is designed to enable the solution provider to better serve customers by helping reduce their Microsoft Dynamics total cost of ownership. PYA Solutions uses the the guidance, tools, templates and best practices provided in the methodology which can help increase the consistency, timeframes, quality and success of Microsoft Dynamics engagements.